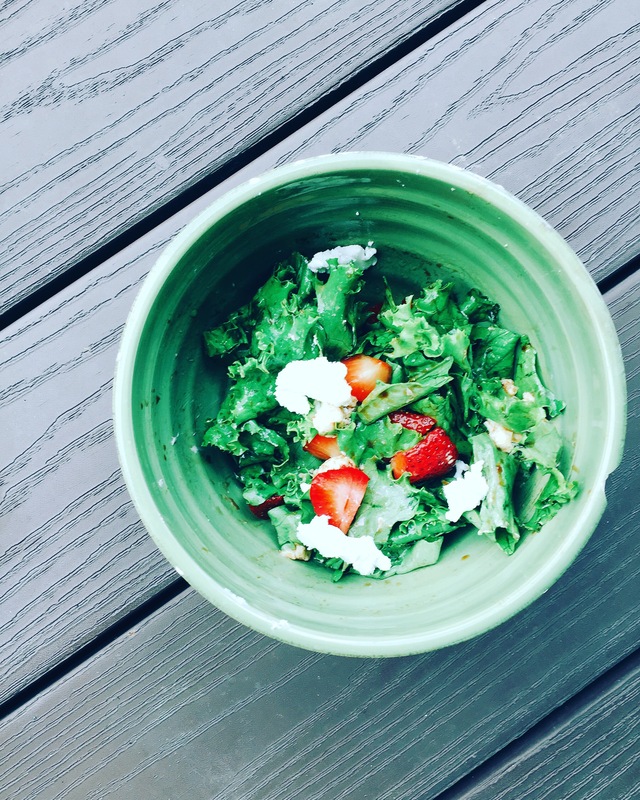 Today I’m sharing a delicious, healthy, and extremely simple dinner salad with you! Can you remember a really hot day, one where the last thing you wanted to do is cook? I love to cook, but adding even more heat into the mix on a 90 degree day isn’t always the best idea. So, I love to make refreshing salads on these days (the combinations are endless!) to share with my family and friends. In fact, this exact salad is inspired by my cousin, Ava! While there are tons of great salad ingredients out there, fresh fruit and goat cheese are a very flavorful, unique choice! Sometimes, it is nice to break out of the typical garden salad rut, and using different cheese and fruits/vegetables you can do that. First, prepare your dressing by whisking together the balsamic vinegar, oil, and maple syrup. Set aside, and wash the fruit and vegetables. Start with the leafy greens, adding in strawberries and red onion from there. Crumble about 1/4 cup of goat cheese into the salad, and mix with 1 tbs. dressing, adding more to taste. Enjoy!